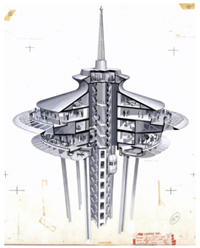 Century 21 Exposition (Seattle, Wash.), design for the Space Needle, cross section of restaurant. Courtesy of University of Washington Libraries. Used with permission. The University of Washington Libraries has been building its Digital Collections since 1996, when the Libraries began digitizing materials in Special Collections. Materials in the Digital Collections are diverse and reflect the strength of the UW Libraries collections including materials about Native Americans, people and places of the Pacific Northwest as well as Napoleonic era caricatures and ephemera from the 1999 World Trade Organization Riots in Seattle. In addition to Libraries collections, there are images from faculty research collections including images of marine life; buildings around the world; and graffiti and other forms of urban communication. All materials in the Digital Collections are freely accessible to scholars and life-long learners around the world. The material types include digitized photographs, exhibits, essays, learning plans, maps, audio and video files and texts. The Libraries Digital Collections site runs on CONTENTdm, a media management software program that the Libraries was a partner in developing along with the University's Center for Information Systems Optimization. Collection-level records are available through the Libraries OPAC and OCLC's WorldCat. Metadata is mapped to Dublin Core through locally developed fields and is harvestable through the Open Archives Protocol for Metadata Harvesting. Recent developments include the use of JPEG2000 to allow easy access to large blueprint and high-resolution image files. Northwest Coast and Plateau Indian Cultures are represented in this an extensive collection of original photographs and documents; these materials are complemented by essays written by anthropologists, historians, and teachers about both particular tribes (Alaskan Tlingit and Tsimshian, Coeur d'Alene, Lushootseed, Makah, Nez Perce) and cross-cultural topics (Indian Boarding Schools, Chief Seattle and Chief Joseph, Salmon, and Totem Poles) . The essays include bibliographies and links to related text and images as well as study questions that K-12 teachers may use as they develop curricula in their schools. 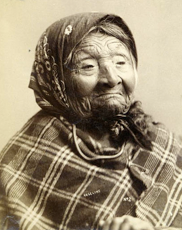 Angeline, daughter of Chief Seattle, ca. 1893. Courtesy of University of Washington Libraries. Used with permission. This database contains selected architectural drawings from the Pacific Northwest Architecture Collection representing regionally significant architects and designers spanning the period from the 1880's into the 1980's. Highlights include plans for the historic Pioneer Building by architect Elmer Fisher; proposals for the Space Needle by the John Graham Company for the 1962 Century 21 World's Fair Exposition; and design drawings for the 1932 Seattle Art Museum at Volunteer Park by architect Carl Gould. The work of Elizabeth Ayer, the first woman to become a registered architect in Washington State, is also represented. A selection of original Civil War correspondence between soldiers on the battlefields and their family members and friends on the home front, these letters describe firsthand accounts of battle, reflections on the nature of war and its profound effect on those involved - both on those at the front lines and loved ones who remained anxiously at home. Many are love letters home to sweethearts and wives, some cautionary advice from fathers to sons, and one a harrowing account of capture and escape over enemy lines. Olympic Nat'l Park Loop. From the Pamphlet and Textural Ephemera Collection. Courtesy of University of Washington Libraries. Used with permission. The letters and original writings have been transcribed as written, with no attempt to change spelling. Many of the correspondents have ties to the Pacific Northwest, some eventually settling in Washington State. Communities in the Northwest Olympic Peninsula region have experienced ongoing cultural conflicts as a result of homesteading, tribal customs, immigration, tourism, aging populations, and the effects of a struggling natural resources-based economy. The Olympic Peninsula Virtual Community Museum Project is a collaboration between local community partners, The University of Washington Libraries, the Clallam County Historical Society (Museum), and other partners to address the cultural, social, and economic challenges of the region. Resources in the Museum include curriculum packets on logging, treaties and homesteading; maps and exhibits, as well as digitized images, artifacts and documents from organizations and individuals on the Peninsula. This project was made possible by a 2003 National Leadership Grant for Library and Museum Collaboration from the Institute of Museum and Library Services. The home page for the collection is here: http://content.lib.washington.edu/.